These versatile religious picture frames can function as decor elements as well as party favors at the next holy event you celebrate. 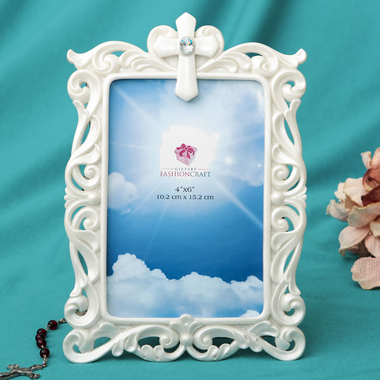 The frames of Size 8" x 5" in polyresin have pristine white baroque designs and hold standard 4 x 6 photos or card inserts. Use it to display table numbers or as place card holders at baptisms, communions or christenings, and let your guests take them home at the end of the day to display their favorite photo at home. Each pearl white frame comes packaged in a white box.